78 Glencairn Street is a spacious 2 bedroom upper flat, occupying an excellent position in this popular locale. The property benefits from kitchen, bathroom, large lounge and two bedrooms. In summary the property layout extends to upper hall, large front facing lounge, kitchen with base and wall units, bathroom with white suite and two rear facing bedrooms. Externally the property has a sizeable section of garden to both the side and rear. 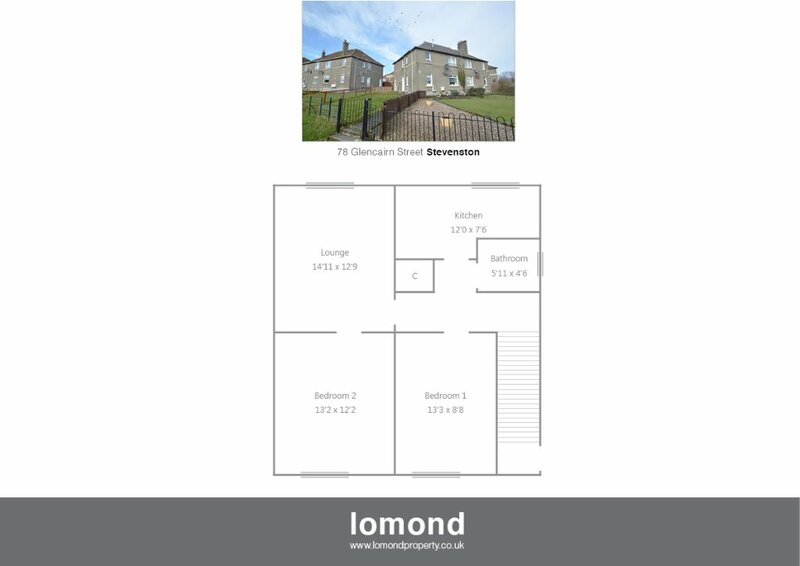 Glencairn Street is a pleasant residential area, Stevenston provides access to a range of amenities including supermarkets and leisure facilities as well as ease of access to the local road networks and surrounding towns. On entering Stevenston on the A738 continue through three roundabouts onto Glencairn Street, continue along before finding the property on your right hand side.